With over five years’ experience working in the beauty Industry this website has been designed to streamline and make it easier and more simplistic to book treatments for you, your friends, family members or guests! Why not contact me today and arrange a time and date where you can be ‘pampered’ in our beauty salon in Ware, Herts or from the comfort of your own home. 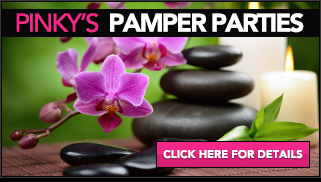 Also… you can receive the latest exclusive offers and discounts on our treatments by signing up to the Pinky’s VIP club. It is 100% FREE to join – Just click here to sign up! You can also benefit from one of my tailor made Beauty Packages. I also have Beauty Gift Vouchers available to treat that someone special!